AirTran will launch daily, seasonal service to Bermuda starting this spring. The low-cost carrier will fly from Baltimore beginning April 7, and Atlanta beginning May 26. Service will stop for the season on September 6 from Atlanta, and October 24 from Baltimore. 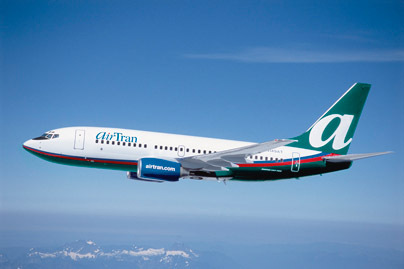 For AirTran, this makes six international destinations: Aruba, Cancun, Montego Bay, Nassau, Punta Cana, and now Bermuda. For now, AirTran will be the only airline operating a daily nonstop flight from the Charm City to Bermuda. Charter carrier USA3000 usually provides seasonal summer service, but hasn’t announced plans for next year. Other major airlines offer connecting service. Delta operates daily seasonal service from Atlanta. Of course, any move by AirTran has to be seen as a move for Southwest, even though the airlines are still separate, independent carriers. And for Southwest, this move looks pretty good. The new routes take off from a major Southwest hub—Baltimore—meaning the carrier can easily connect flights from other cities to its Bermuda service, notably the New York area and Boston. This allows Southwest to compete with JetBlue, American, and Continental, all of which serve the tiny island from those cities. Similarly, Atlanta will become a major hub, if not Southwest’s busiest destination, once the AirTran acquisition completes. Many people may be wondering if Southwest will keep AirTran’s international service, including this new route, but I think it’s pretty clear it will. After all, AirTran’s international network was a major reason Southwest bought AirTran in the first place. AirTran’s Caribbean and Mexico service provided a quick and easy way for Southwest to add popular destinations to its dominant domestic network, and Bermuda likely fits in nicely. Readers, where else would you like to see AirTran and/or Southwest fly?